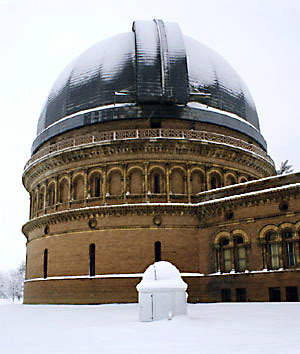 Yerkes Observatory in Williams Bay, Wisconsin, hosted nineteen Chicago inner-city middle and high school students for this year's KICP Space Explorers Winter Institute. The theme of Mapping Motion was developed in conjunction with the Chicago-wide Festival of Maps. Under the guidance of instructors including KICP Director of Education and Outreach Randy Landsberg, Associate Fellows Jeremy Tinker and Chris Thom, and graduate student Zosia Krusberg, students participated in labs such as ''Shoot the Monkey'' and ''Weighing a Black Hole'' to explore the force of gravity and the ways in which scientists use our understanding of gravity to map motions in the Universe. A special highlight was a presentation by KICP Visiting Scholar Joao de Mello on the Pierre Auger Observatory and its very recent results on tracing the source of ultra-high energy cosmic rays back to activity caused by extremely massive black holes at the center of galaxies. 2007 KICP Space Explorers Yekes Winter Institute participants. 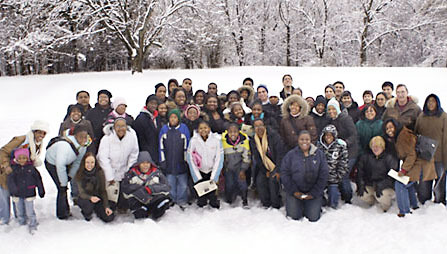 The Yerkes Winter Institute is three-day science immersion program held at the end of December during a break in the Chicago Public School academic year, offering students a unique opportunity to interact with research scientists and directly engage in the process of science. During the Institute students cycle among three thematically connected daytime laboratories, evening experiments, lectures, and observing (weather permitting). The experience culminates with presentations by the students to their parents and younger students about the institute laboratories. Yerkes Observatory, Williams Bay Wisconsin. ''Shoot the Monkey'' lab experiment exploring projectile motion. Student presentation on the motion of a pendulum. KICP Associate Fellow Chris Thom diagrams trajectories. Chicago Public School Teacher/KICP Summer Researcher Aurora Tyagi helps students with calculating the mass of a black hole. KICP Associate Fellow Jeremy Tinker answering questions about the observed motions of stars around the black hole in the Milky Way Galaxy.